Twelve Dickinson students traveled to Hawaii over winter break to participate in a cultural exchange service trip, during which they learned about Hawaiian history and the state’s relationship with land. 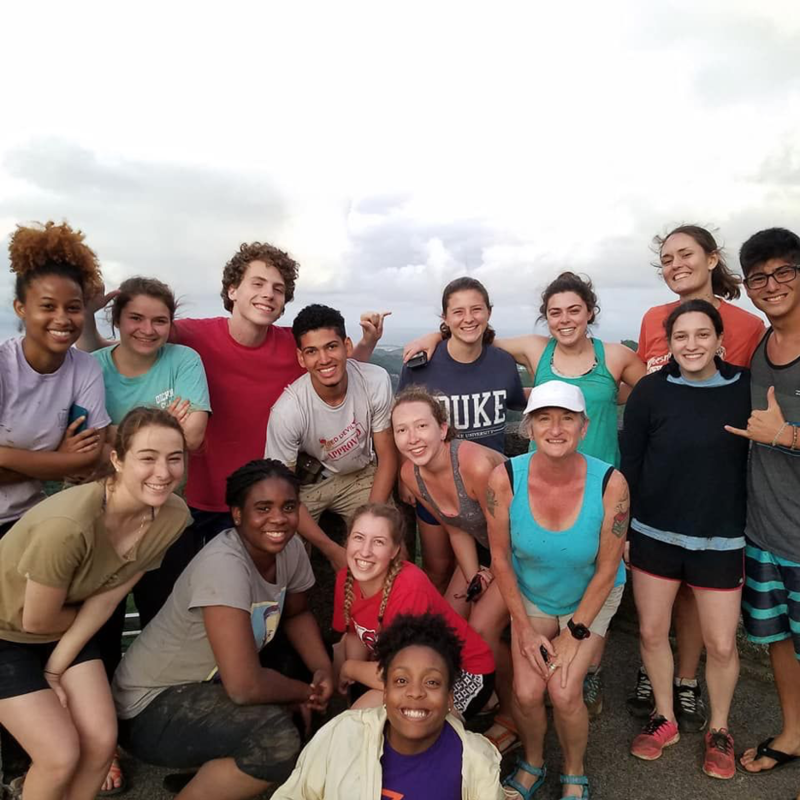 “The Hawaii service trip was not just about service but also about learning the Native Hawaiian culture and the history of the islands,” said Julia Thulander ’20, a student who went on the trip. The Dickinson group was led by native Hawaiians and students from Chaminade University. The Center for Service, Spirituality and Social Justice (CS3) hosted the exchange with Chaminade University and the University of Hawaii. On the trip, Dickinson students helped restore a stream, visited Ulupō Heiau state historic site and volunteered at native farms to remove weeds and invasive plants. At Ulupō Heiau students planted taro, a root vegetable and staple Hawaiian food. “We helped to move a 600 pound rock, removed soil so that more taro could be grown, we stomped some leaves into the mud to help fertilize, and… evenly distribute[d] mud in preparation for taro planting,” said Shea Player ’22. Students visited the Bishop Museum and the Iolani Palace to learn about Hawaiian history. “It was incredible to see the richness of Hawaii’s history,” said Tara Fischer, director of Academic Advising, who went to Hawaii. “Towards the end, we shifted our focus onto the military presence in Hawaii by attending the Pearl Harbor Memorial and working with a retired veteran to clean up a sacred park through a non-profit organization,” she said. The trip was “meant to introduce students to a more traditional Hawaiian experience, exposing students to the rich and complex history of Hawaii, and an understanding for the complicated state of political, economic and interpersonal affairs that exist today in the wake of the cultural revival that has taken place over the last thirty years,” said Fischer and Donna Hughes, director of CS3 and another administrator on the trip, in a joint statement. Twelve students and two administrators went on the trip. Students were accepted based on an application and group interview with the two co-leaders of the trip, Janaiya Banks ’19 and Valerie Busch ’20. Fischer said “it was important to focus on all types of diversity, thinking culturally, campus involvement, interests, major and of course class years” of applicants. CS3 has four spring break trips: Interfaith to Pittsburgh, Pa., Habitat for Humanity in Sea Island, S.C., Fuller Center in Georgia, Camp Restore in New Orleans. Applications for these programs are due Feb. 1 at 11:59 p.m. Applications for the Navajo Nation service trip in May have not yet been released, as of print time.